Wannafind Review 2019: Is Wannafind a Good Hosting? Wannafind.dk A / S has over 15 years of experience. The company provides web hosting, dedicated servers, domain registration, hosted exchange, productivity solutions, and SSL certificates. With over 30,000 customers, it’s one of the leading hosting services in Denmark. Founded in 2000, Wannafind.dk A / S has carved a niche for itself in the blossoming Danish hosting marketing. It was founded by three guys who wanted to provide fast, secure, and reliable hosting to local Danish companies. The company is an ISO: 27001 certified, VMware partner, and Gold hosting Microsoft Partner. One of the challenges of using shared hosting services is that traffic swells on servers to the point where websites go offline. Wannafind operates redundant servers in a state-of-the-art data center, which is how it delivers an impressive 99.99% uptime guarantee. Whenever there’s a spike in traffic, the extra server offloads some of it to prevent downtime and system errors occasioned by large traffic volumes. With its webshop solution, you can set up an online store with four simple steps. Simply select a responsive template in the admin panel, personalize your content, add a payment gateway, and launch your webstore. It has plans for beginners and ambitious sellers who want to maximize sales online. Be sure to check out its e-commerce guide if you’re interested in this service. It’s also nice to see that Wannafind doesn’t cap transfer traffic. In fact, it’s free and unlimited across all plans. Besides that, it backs up website data to two locations daily for 21 days and leverages advanced network technologies, firewalls, and security measures to keep your website and users safe. Pricing-wise, Wannafind’s hosting packages aren’t just transparent, but compare favorably with those of top-tier hosting services such as Godaddy, SiteGround, HostGator, and others. 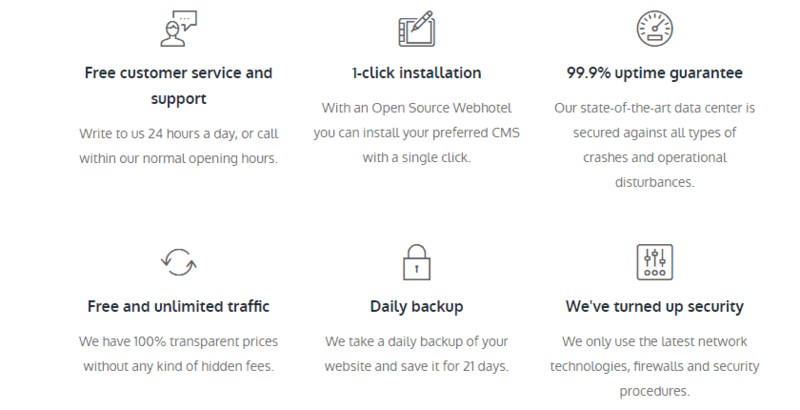 You can expect all of the standard features and a number of value-added extras such as SSL certificates, extra storage, dedicated IP address, and web store solutions. My only concern is that they charge for a one-click installer, additional subdomains, cron jobs, mail aliases, and MYSQL databases, something which many hosting providers offer for next to nothing. I have never hosted with a Danish company before, so naturally I had lots of questions. First, was whether it would assist with a website transfer. I didn’t find answers in the well-documented knowledge base, so I sent an email. Sure enough Lars, the CS guy, replied within 30 minutes saying that its available, but at a cost. 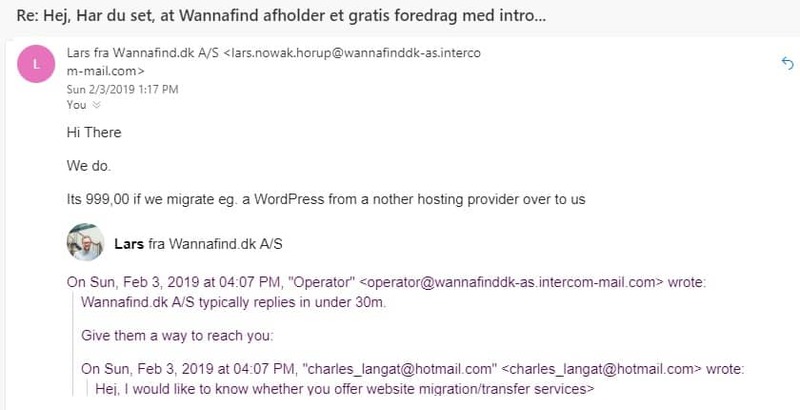 With an excellent uptime and efficient backups, Wannafind.dk A / S gives its customers a safe and stable web environment to create and manage its websites, emails, and databases. Wondering how Wannafind stacks up against other Web Hosting companies? Enter any other Web Hosting company and we will give you a side-by-side comparison.